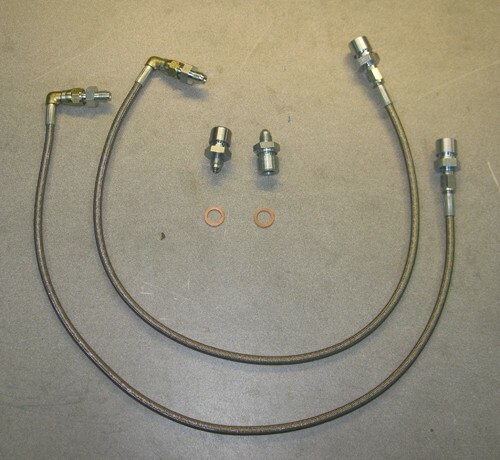 Braided stainless steel brake line kit for 65-66 Mustangs with original style Kelsey Hayes 4 piston calipers. Teflon inner liner and stainless steel braid eliminates hose expansion, common to original rubber lines resulting in better braking performance and a firmer pedal feel! 2 x Teflon lined, stainless steel braided hoses. 2 x Adapters for the end of the hose to the calipers. 4 x Adapters for the end of the hose to OE hard lines including groove for OE brake line clip. 1965-73 Mustangs using big style Kelsey Hayes T-bird/Lincoln 4 piston cast iron calipers with 3/8" inlet. Choose '65-66' set for cars with the hard line mounted vertical on the inner fender to the rear of the UCA (typically all 65-66 cars). Choose '67-73' set for cars with the hard line mounted horizontal pointing forward under the UCA (most 67's and typically all 68-73 cars).